Samford University is offering the chance for students of all ages to discover various topics of interest through summer programs. With 19 camps, there is a program fit for all students looking to explore unique interests. Students further their performance abilities while increasing their knowledge of music. Learn about careers in athletic training, sports medicine and physical therapy. Students participate in hands-on demonstrations. This one-week (for grades K–5) and two-week (for grades 6–12) camp gives students the chance to plan, create and participate in a theatre production. Students engage in lively discussions about Great Books with faculty members and other exceptional high school students. Students study business methods used in modern finance with faculty and professionals. Animate is an academy in worship, theology and the arts for high school students and their mentors. Register as an individual or a team from your school or congregation. In this overnight camp, learn about careers in pharmacy, participate in hands-on pharmacy lab demonstrations and tour local health-care facilities. Based on the verse Micah 6:8, students study concepts of justice, mercy and humility. As a part of this study, they will meet with experts on Birmingham’s civil rights legacy. 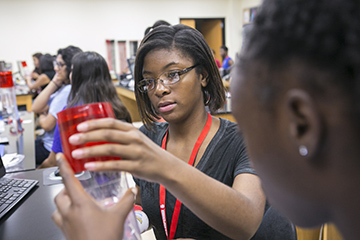 This program offers college preparation and mentoring for outstanding minority students interested in science. Students learn 21st-century debate skills to compete at the highest levels. This program features expert panels, a mock trial, analysis of legal cases and advice about law school application. This program features premedicine advising, expert panels, networking and field trips. Students explore cutting-edge science and the challenges of a human mission to Mars. Samford’s Academy of the Arts also is offering several summer programs. A learning experience for preschoolers ages 3–5 and 6-year-olds who have not attended first grade, campers a week of singing, movement, listening activities, music literature features, crafts, orchestral instruments and learning centers.